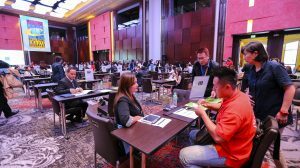 The Philippine Travel Exchange (PHITEX) 2017 kicks off at the SMX Convention Center today, August 30, with business-to-business meetings between some 210 foreign travel agents and 236 local tourism players. To officiate in the PHITEX proceedings is Tourism Promotions Board (TPB) International Promotions Manager Maricon B. Ebron, who will also brief the participants on the conduct of the one-on-one meetings that are geared to yield high-volume business deals between the foreign buyers and local sellers. The whole-day event will culminate in a grand reception at 7:00 p.m., with Tourism Secretary Wanda T. Teo delivering the welcome remarks and Senate Tourism Committee Chair Nancy Binay for the keynote address. To introduce Binay as guest of honor is TPB Chief Operating Officer Cesar Montano. “The business meetings continue the following day before the foreign buyers proceed to their city tour of Manila and the local sellers to their seminars on Tourism Trends and Forecasts, Travel Consumer Protection and Fair Adjudication, Tourism and Sustainable Development, Mitigation and Marketing in Times of Crisis, and The One – Country Approach in Marketing the Philippines,” Montano said. “The seminars will provide our local sellers with the facts and figures for use as basis in formulating their product development and marketing strategies to widen their market reach and increase client capture,” Montano added. Some of PHITEX foreign buyers are scheduled to go on a tour to any of the seven pre-arranged regional destination clusters — Ilocos region, Tagaytay &Batangas, Albay-Sorsogon, Iloilo & Negros Occidental, Sabang & Puerto Princesa, Cebu &Bohol, and Dumaguete-Siquijor-Sumilon island chains on September 1 to 4. “All in all, the entire event (PHITEX) is designed to generate new and favorable testimonials, new global tourism market insights, new quality benchmarks, new areas of marketing engagement, and new strategic tourism business options and opportunities,” Montano stressed.